I’m a big fan of Adobe’s Pho­to­shop Express as an online ser­vice. Basi­cal­ly it’s a free online image orga­niz­er / stor­age box and a col­lec­tion of robust image edit­ing tools (Sim­i­lar to Flickr and Picasa). But where Adobe’s tried to dif­fer­en­ti­ate Pho­to­shop Express from the com­pe­ti­tion is by also releas­ing a free and pow­er­ful Pho­to­shop Express iOS image cap­ture and edit­ing app that ties into the Pho­to­shop Express online ser­vice. Nice to see some of these fea­tures bun­dled in, and option­al — buy ‘em if you need ‘em — oth­er­wise you’ve still got access to a good set of image cap­ture, edit­ing and shar­ing tools, for free. I’ve been a fan of the World Her­itage Sites iPad app for a while, sim­ply for the qual­i­ty of images at Her­itage Site loca­tions. Mem­o­ry of Col­ors isn’t real­ly an app that you use to tweak or mod­i­fy images on your iPad, rather it’s an app that cap­tures my atten­tion and inspires cre­ativ­i­ty while look­ing at endan­gered cul­tures through­out the world. Mem­o­ry of col­ors fea­tures a rich col­lec­tion of por­traits that pro­vide a look at humanity’s frag­ile diver­si­ty in over 18 coun­tries, from Alge­ria to Yemen. Assem­bled in an infi­nite col­or palette, where each col­or rep­re­sents a facet of human cul­ture, the por­traits bring a mes­sage of peace, tol­er­ance and respect for those that are being threat­ened by glob­al­iza­tion. The mas­ter­piece cre­at­ed by pho­tog­ra­ph­er Jaime Ocam­po-Rangel took over 12 years to com­plete, and required a colos­sal amount of research, logis­tics, and diplo­ma­cy. “I set out to pre­serve the beau­ty of these peo­ple before it’s too late, and cre­ate a pause in time and space to cap­ture this world’s last authen­tic images,” said Jaime O’Campo-Rangel. The project was first exhib­it­ed at UNESCO’s head­quar­ters in 2010. Mem­o­ry of Col­ors is avail­able in the app store at a launch price of .99 for one week — nor­mal­ly $2.99. 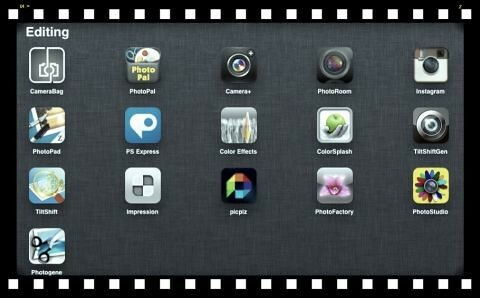 This is a very cool cam­era app for iPhone, though you can use it on the iPad for image edit­ing and shar­ing. One of the neat­est fea­tures on the iPhone is the abil­i­ty to spec­i­fy the zone where the light meter will read, sep­a­rate from the zone where the auto-focus will read. Cam­era+ 2.1: Per­for­mance, sta­bil­i­ty, and robust­ness, oh my! For Cam­era+ 2.0, we added over 50 awe­some, new fea­tures]. For ver­sion 2.1, we’ve switched gears and worked hard to make the over­all expe­ri­ence of using the app much more plea­sur­able. We made a whole bunch of speed improve­ments so every­thing feels zip­pi­er. We fixed many nig­gling bugs so the app now has a much more sol­id feel to it. And we added many lit­tle fea­tures and user inter­face improve­ments so that it’s much more intu­itive and more of a delight to use. Wel­come to iPad Dark­room — my new blog high­light­ing apps, tools, and tech­niques for using Apple’s iPad as a mobile dig­i­tal dark­room. It’s still a lit­tle rough around the edges, but things will fill out over the next few days. As you will see by scrolling through some of the posts here already, this will be a fair­ly focused blog. Actu­al­ly I didn’t, but that won’t stop me from hav­ing one! My good friends at Mac­Phun have gra­cious­ly pro­vid­ed me with a few codes to two great apps I use in my iPad Dark­room — Pho­to Pal and the recent­ly updat­ed FX Pho­to Stu­dio HD. More details on the con­test here. So, I’ve laid the ground­work for this explo­ration into mobile dig­i­tal dark­room tech. What should we talk about? What do you want to see here? Let me know, and if you’ve got some apps you’d like me to look at or share with oth­ers, please feel free to com­ment or ping me direct­ly using the Con­tact page.